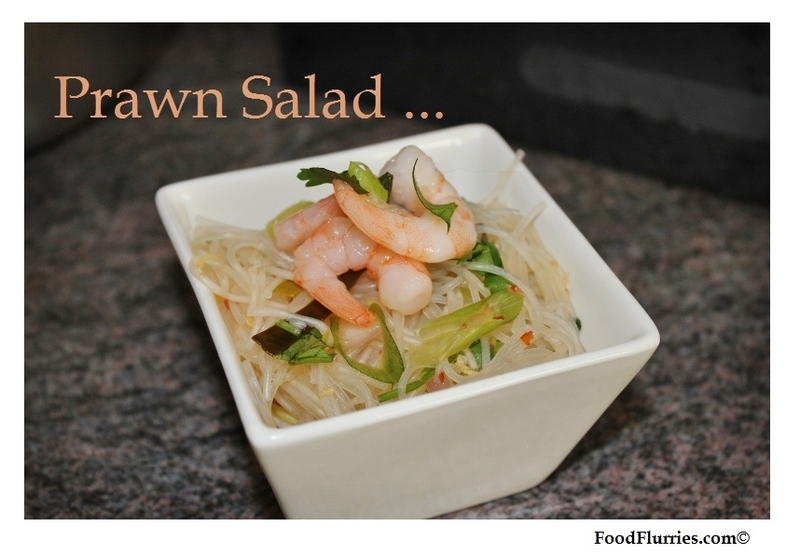 Thai glass noodle salad … mmm. I had this wonderful dish for the first time when I went to my friend’s bistro a couple of years ago. It was a family gathering and we booked out the place. The kitchen specialises in Thai cooking … the best kind … coz all the workers were of either Thai or Cambodian origin. One of the dishes served that evening was this salad, and my eyes lit up at the first bite. It was light and clean on the palatte but being true to Thai cuisine it was also freakin spicy thanks to the bird’s eye chilli. My years spent away from home has reduced my tolerence for spicy food considerably. These days I am a disgrace to my mother and she sometimes rolls her eyes at me for whinning about the spiciness of her homemade curries. But I just can’t do it! So she has resorted to reducing the amount of chillies in her cooking, or she simply steers clear of spicy dishes altogether. Glass noodles are wonderful. Their slick, slippery texture as you take a bite is unlike any other noodle experience out there. In Singapore during my college years one of the cheapest meals a lowly, income deficient student could have is a bowl of Tung Hoon Fishball soup ~ which is basically glass noodles in fishball soup. The addition of the soup made it almost impossible to grip the noodles with a pair of chopsticks. Made for good practice even for a seasoned chopstick user like me. The noodles are also very versatile and can be used in so many different ways. Fry ’em up with some dark soy and mince pork. Or stuff them into ricepaper rolls, a la Vietnamese Spring Rolls. Add them to braised crab stew. All very different dishes, but all super yummy. In a previous article I used glass noodles in my Home-Style 5 Treasure Soup. Glass noodles are called a variety of names, but they all mean the same thing : Tung Hoon, cellophane noodles, Soe oen, dōng fěn, mung bean noodles, bean thread noodles and Chinese vermicelli (not be be confused with rice vermicelli, which is made from rice flour). Glass noodles are made from bean or potato starch. When they are in their dry, dehydrated form in their packaging they look pretty similar. But once you soak the strands in warm water their stark differences will be become obvious . 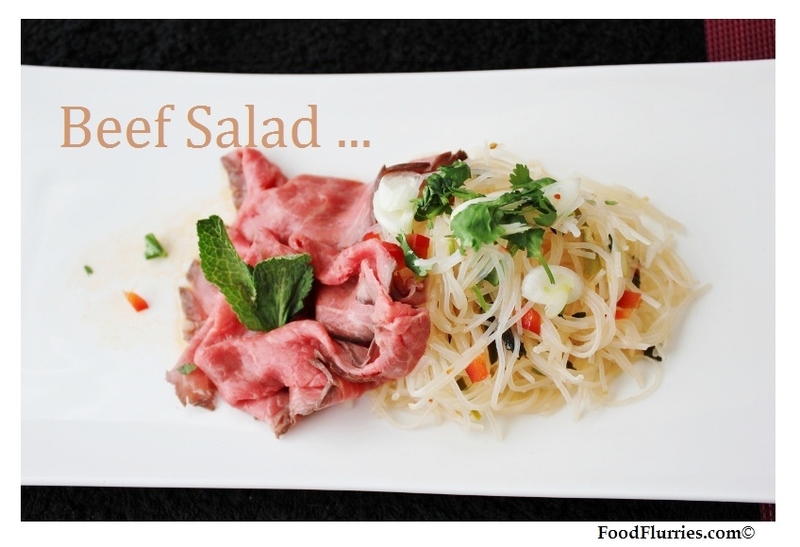 Both will soften, but rice noodles will remain opaque while the glass noodles will become transparent. 1. Soak the noodles in hot water until translucent. Then drain off in a colander. 2. Mix all the other ingredients in a bowl (except the beef strips). Stir well to combine and taste frequently as you go along. 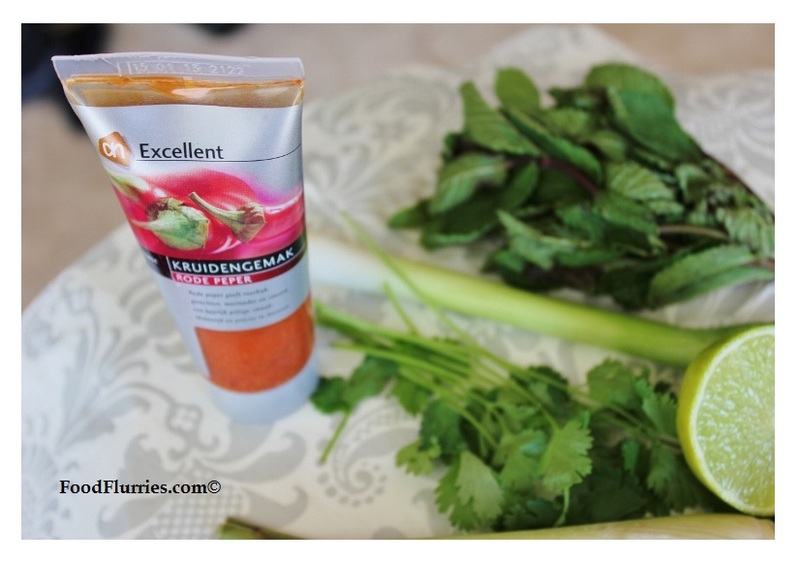 Adjust the seasonings according to your taste ~ you might like more chilli, more fish sauce or more sugar. 3. Add the noodles to the bowl and mix thoroughly with your hands, ensuring the herbs are well distributed throughout the noodles. 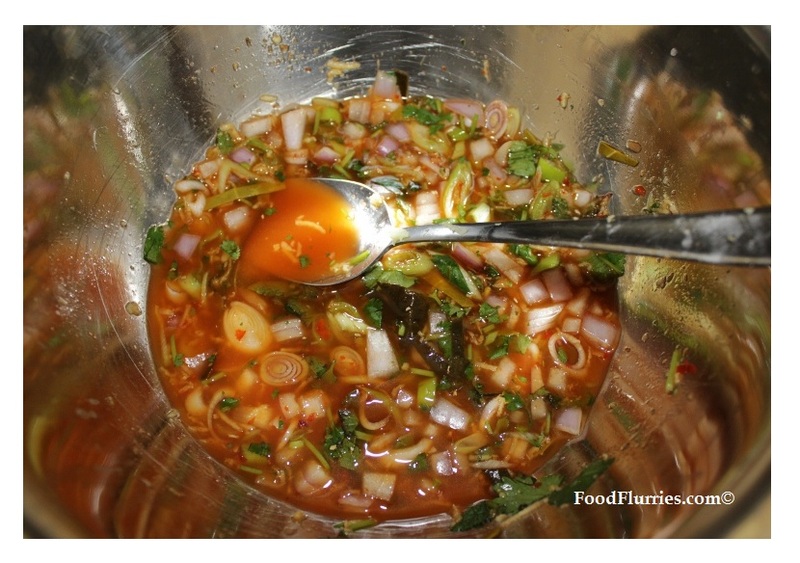 Leave the noodles to soak up the sauce for about 10 to 15 minutes, then drain off any access. 4. Cover with cling film and chill in the fridge for a couple of hours. 5. After 2 hrs, plate up the noodles and place the beef strips on the top, garnished with more spring onions and corriander. Serve cold. This recipe is versatile enough for you to make variations without changing to dish too much. If you don’t have roast beef on hand then fry up some ground pork or chicken with some minced garlic and basil leaves … tiny bit of chicken stock. Transfer to a bowl and chill thoroughly in the fridge, draining off any access liquid if any. Before serving the noodles, simply mix the ground meat into the noodles and garnish with more herbs and crushed ground nuts. Here is a seafood version. Seafood goes really well with this dish, and compliments the limey-citrusy notes in the sauce. Simply get yourself a handful of cocktail shrimp, crab meat and squid. You can buy all these precooked at your local fish mongers or you can do it all yourself at home by poaching them very gently in some water seasoned with mirin, lemongrass and lime juice. Plate up as before with some lime zest for garnish. 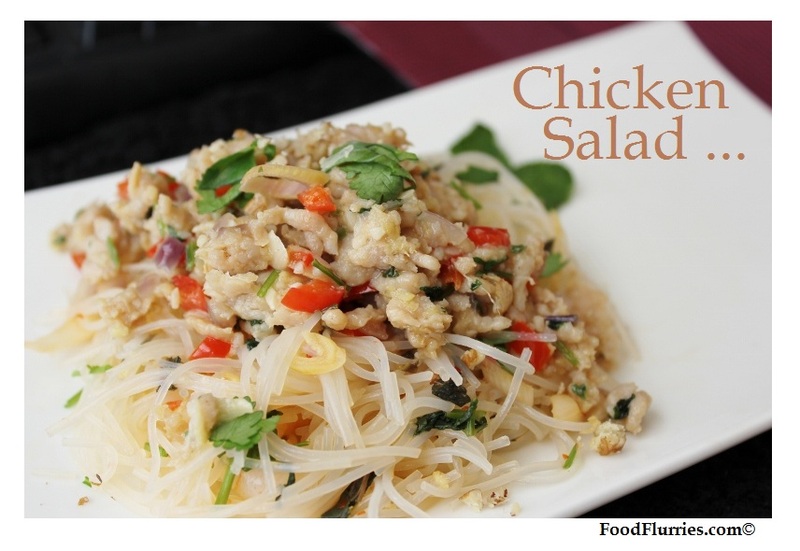 This dish is low in fat, super healthy and SUPER yummy … I could eat this everyday. LOVE it, so I hope all of you will give this a try and let me know how you get on. NOTE : Pls note that the noodles I have used in this recipe, whilst it was printed on the package that it was authentic bean thread noodles, they don’t look like it. They look very much like regular rice vermicelli noodles. Very miffed! UPDATE : 19th Aug 2012. I believe I have an apology to make about dissing the noodle company. It was entirely my mistake for not prepping the noodles right and they ended up looking like rice noodles as opposed to proper transparent glass noodles. Yesterday, I had some pre-soaked noodles leftover in a bowl (in the fridge) and I decided to fry it up with some mince chicken and Asian herbs. The minute they touched the hot pan they began to lose their opacity and VOILA!! …. glass noodles galore! Morale of the story : Don’t just soak the noodles in hot water. Actually place them in a pot of actively boiling water until they turn translucent then immediately shock them in ice cold water to stop them from over-cooking.Glad to have discovered this and had the opportunity to correct myself on this error. * insert sheepish grin here*.